Operation Panama Express is a long-standing Organized Crime Drug Enforcement Task Force which targets the international delivery of illegal drugs through the use of vessels on the high seas. It is based in Tampa, Florida, with most operations occurring in the international waters of the Atlantic Ocean and the Gulf of Mexico. 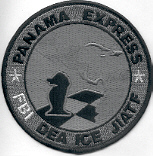 Members of the Operation Panama Express team include: U.S. Attorney for the Middle District of Florida, Coast Guard, JIATF-South, Immigration and Customs Enforcement, Drug Enforcement Administration, Federal Bureau of Investigation, Internal Revenue Service Criminal Investigative Division, Florida Department of Law Enforcement, and the Sheriff's Offices from Pinellas and Sarasota Counties.